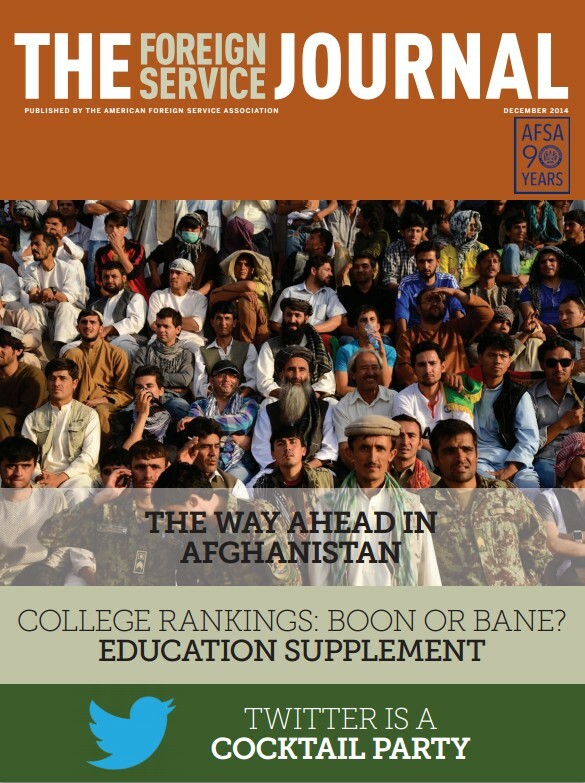 The December issue focuses on the future of Afghanistan as the U.S. marks the official withdrawal of U.S. military forces. What is the situation today, and what can be expected for Afghanistan, tomorrow and in the years to come? The Journal examines these questions through three articles from retired Foreign Service officer Edmund McWilliams, Director of the United States Institute of Peace’s Afghanistan and Central Asia Program Scott Smith, and former Deputy Assistant Secretary of Defense for Afghanistan, Pakistan and Central Asia David Sedney. Although each author offers different viewpoints and suggestions, all agree that without some continuing U.S. engagement, Afghanistan’s future is very much in doubt. In addition, entry-level Foreign Service officer Wren Elhai makes the case for including Twitter as an indispensable part of the U.S. diplomatic toolkit, and AFSA President Bob Silverman remembers fallen colleagues in his monthly column. This issue also contains our semi-annual education supplement, focusing on educational information for Foreign Service families. Effective U.S. leadership is more important than ever in Afghanistan. What policies should we adopt to help as Afghans take the reins of their own country? The boarding school option has much to offer Foreign Service kids.